The Vermont Sports Hall of Fame announced the class of 2019 inductees on January 9. VSWGA is proud to share the news that among the 13 athletes to be inducted on April 13 is Holly Reynolds, nine-time State Amateur Champion and long-time VSWGA member. Holly’s impressive bio for this honor, which appears with the announcement, is below. More information about the event on April 13 can be found on the Vermont Sports Hall of Fame website. 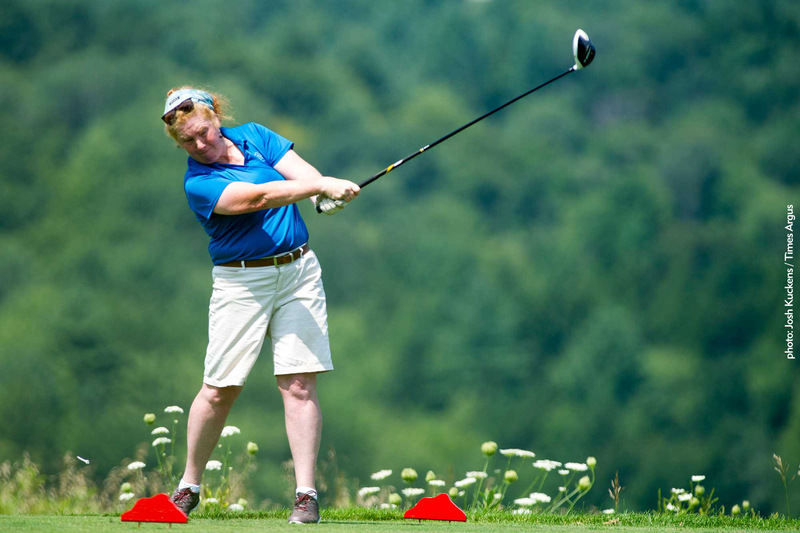 Holly Reynolds has won more Vermont Women’s Golf Association amateur championships than any other competitor, her total of nine surpassing the seven won by fellow Vermont Sports Hall of Fame inductee Mae Murray Jones (VSHOF ’43). Bracketing a professional career, Reynolds captured five straight state amateurs from 1989 to 1993 as well as the 2010, 2012, 2016 and 2017 titles. The five straight championships equaled the mark set by Jones and later by Libby Smith. Reynolds holds the lowest one-day record in the state amateur carding a 68, set in 1992 at the Manchester Country Club, which she later broke with a 67 in 2010 at Vermont National in South Burlington. She also holds the mark for largest margin of victory of 18 strokes set in 1993.In 2001, she set the record for lowest winning final score in the VWGA Mid-Amateur at 144. Prior to her Vermont Amateur success, Reynolds was a four-time Vermont high school champion, 1987 through 1990 while competing for Peoples Academy. She received a full scholarship to attend the University of Kansas, where she was a four-year member of the Jayhawks, rising to the team’s No. 1 player by her senior year. Reynolds was the medalist in seven tournaments during her time at Kansas and won seven tournaments. She was named All-Big 8 for both her athletic and academic accomplishments. She won the New England amateur at Crown Point Country Club in Springfield in 1992 and was the runner-up in the 1993 USGA Public Links championships at Jackson Hole, Wyoming in 1993. Reynolds turned professional after her college career and was named player of the year for the 1994-95 Central Florida mini-tour. She won a Futures Tour tournament in Endicott, N.Y. in 1995 and qualified for the 1996 and 1997 U.S. Opens. Reynolds set a course record during an LPGA qualifier at Rancho Mirage, Calif. with a 65 on the Players Course. She regained her amateur status with her return to Vermont and continues to be a dominant player.